He was a pleasure to watch play as his game was basically all heart. The serve was ugly, the forehand shaky at best, but he knew how to play according to his way of thinking. He basically never deviated from what he did best, which was to fight for every point. Then in the finals the unimaginable happened, his back seized up to the point where the pain was too much and lost against a good player. He was devastated. I was so touched by his heart that I told his mom, Shelina, who was with him that if ever I could assist in helping Raheel to please let me know. Raheel was fortunate enough to be from Pickering where Dave Ochotta, Allan Care and Irfan Shamasdin provided him with guidance and assistance with the help of his father and brother. As Raheel developed, many of the great players from the Pickering area started venturing out on the tour: Adil Shamasdin, Brayden Schnur and Andrew Ochotta. His brother, Zain Manji opted not to go to the US on scholarship but also was not as available for Raheel. As a result in January of 2013 we got a call from Raheel and his parents indicating that Raheel wanted to move to Burlington to pursue his training at ACE. With my good friend and partner, Doug Burke, we decided to assume responsibility for his development. We had done this previously, the first time with nineteen year old Daniel Nestor. The first thing we did was evaluate him and we realized that as much as we loved him, the technical-tactical flaws in his game were a huge liability. His physical development was way behind and we suddenly realized that mentally his desire to win was so strong that at times of stress he would always revert to his “they will have to kill me on court” attitude rather than “Now it’s my turn to finish it”. This came a lot from Raheel knowing his technical deficiencies and not having the confidence to close the matches under pressure. Doug and I decided to do nothing with Raheel’s game as the Provincials and Nationals were approaching. He went on to win the Boys Under 16 Nationals in Montreal playing with his heart and waiting for the other players to lose. He was ecstatic and simply came back even more committed to his dream of becoming a pro player. He was going to finish school a year early and he wanted to take the year to see if he could make it to the pros. We made him see the folly of this idea as all was against him: the quality of his game, his physical development and a lack of funds. On the other hand we made him see that having an education, playing good development tennis for four years and then,after graduation at the age of 21,going on tour would be a better alternative. A lot happens to a boy’s body from 17 to 21 when he gets to eat that American cafeteria food and plays lots of tennis. Raheel accepted and of course his parents were in complete agreement with the decision to postpone his venture to the pros. Raheel’s game was redesigned to fit his skills. He now had five years to work at what he is going to look like by the time he is 21. Clement Golliett, ACE’s physical guru oversaw his physical program, Sue Wilson ACE’s mental trainer started addressing his behavior in the stressfull portions of the match. We made him play earlier, he got stronger, learned how to move better on the court, added a very good forehand, improved his serve and developed his overall understanding of how to finish the points at the net. The past summer was a great experience for Raheel where he was part of the winning Canada Games Gold Medal Team. His dream was now to get his first ATP point. He qualified for his first Men’s Futures event and just kept on progressing. In the fall he had some good results and signed with the University of Indiana in Bloomington for the fall of 2014. Suddenly with lots of play with college players dropping by ACE, Zach White, Victor Hoang and Brayden Schnur you could feel the improvements coming along. In early winter he won two selection events dealing with the fears of doing what he was supposed to do in pressure situations. It was not always pretty but he managed. 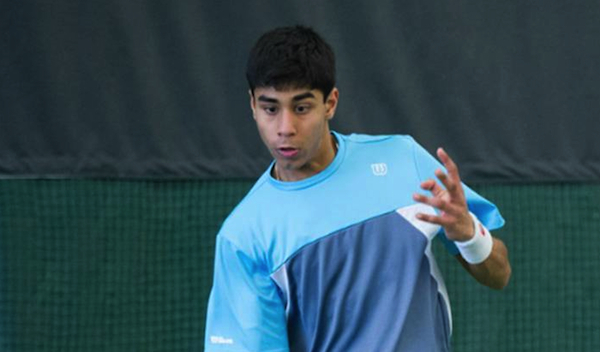 Last week thanks to Guillaume Marx and Louis Borfiga Tennis Canada, Raheel got a wild card in the main draw of the Futures in Gatineau. In his first round he defeated Luis Patino from Mexico, ATP 965 to earn his first ATP point at the age of 16. The fact that he lost in the next round was not such agony as he won two doubles matches, got to the semis and got his first ATP doubles point. His text to me following the tournament read as follows: ”I really feel like I can compete with everyone here, none of them intimidate me with their skills you know. It’s just building the serve, continuing to improve the forehand as a weapon, solidify the backhand and get more experience”. Raheel is the consummate example of developing excellence in an individual. He does not look overwhelmingly great, but potential of the heart is the greatest quality of a player and the only one that really cannot be measured. He has learned to implement as well as listen. He is a gem. To be followed…. Pierre, all the best to you and your team! Great Article Pierre! I have seen Raheel train and compete since he was 10 years old. I am amazed by his smarts and sense on the tennis court as well as his competitive spirit. Such a nice kid with a lot of charisma. I am very happy to hear about his breakthrough to the pro’s. Congrats to you,Doug, Raheel and the rest of the ACE Team. So true! Talent is only 2% of the equation. Good luck Raheel! Good luck Ace! Good luck to all kids with big hearts! Great article! We will certainly be referring some of the young talent we see to ACE’s excellent programs. Our team loves doing intro programs but nothing would make us prouder than to have one of our beginners end up a story similar to Raheel’s. Raheel is a great addition to ACE and Cedar Springs. He respects players, members and the club. With such a strong work ethic I look forward to hearing about him in the future. Great article on Raheel! My son is a huge fan of Raheel and we follow all his results. I personally, am inspired by him because he is the hardest working kid that I have crossed paths with. My son, who is 7, told me his goal is to play Davis Cup with Raheel after we got to watch Raheel play the U.S.A. in Montreal. Great work Pierre and keep on going Raheel. Was just wondering who Raheel’s practice partners are? Is there anyone to push him in practice at ACE? How important is having good hitting partners in developing a high level competitor? – Roger Federer, when asked about youth tennis and how the U.S. men can re-establish their dominance. i became reading throught a number of the posts and i identify these to be plumb interesting. abject my english is just not exaclty the really best. would there be anyway to transalte this into my vernacular, spanish. it may well in fact usurp us a lot. since i could approach the english interaction to your spanish language. There’s a whole lot we just don’t know. But we do know that once you’ve become very fat, your body fights to stay there, or to return there if you lose weight. The big question is why. I use slimfast powder.I don’t know of any other. hi!,I like your writing very so much! share we be in contact more approximately your post on AOL? I need an expert on this space to resolve my problem. May be that’s you! Having a look forward to see you.